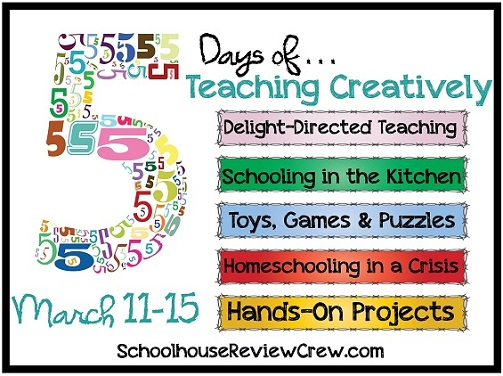 This week several bloggers from the The Schoolhouse Review Crew are sharing posts on 5 awesome subjects: Delight-Directed Teaching, Schooling In The Kitchen, Toys, Games & Puzzles, Homeshooling in a Crisis and Hands-On Projects. Don't forget to enter the HUGE giveaway!!! Today I am sharing information about games. We LOVE games. We have lots of fabulous board games, computer games, console games but we often make up our own as well. It is so easy to turn anything you are learning about into a game and for some reason strange reason when you do those dreaded subjects become more fun and exciting!!! I have lots of posts about games including how we played a game with our science vocabulary cards and handwriting without tears curriculum. But today I want to share a new game we just discovered. I learned about this game on TED TV (one of our favorite Roku Channels). The video is entitled, "Reinventing the encyclopedia game" and you can watch it below. When I watched this video I instantly turned to my husband and said that is exactly how our homeschool days go. We start on a topic and most often end up discussing a related topic (part of that whole delight-directed learning). But this "encyclopedia game" goes one step further...watch it to find out what I mean. As you can see this game is super exciting and one we will be utilizing in our homeschool. We will be playing this game a few times a week. It is a great warm up exercise for children of any age and to take it one step further children can write a journal entry about their journey and discoveries. We are currently learning about weather so that is where our game started. The first time we played the game I wanted to basically show the kids how it worked. So I choose the links to words that I had no clue of the definition or that intrigued me. And we ended back up at weather. The kids had lots of fun exploring each page and looking at the pictures and diagrams. So I say our first encyclopedia game was a success. Don't you just love the internet??? Awesome! I can't wait to try this. I really need to make games more a part of our lessons. The kids love them. this game up now, cannot delay to get going.